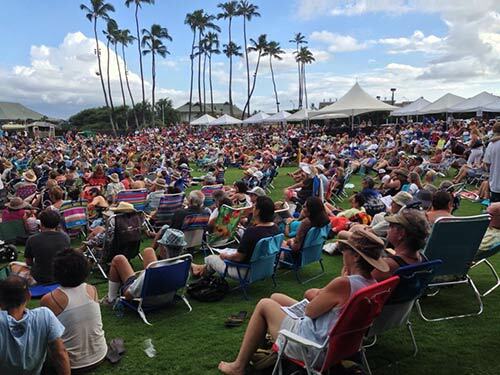 The best quotes from student reviews of concerts on Maui from October to December 2013: Anderson & Roe, Dan Tepfer, Maui Holiday Pops. Ukelele Festival, and Harps and Horns. One important assignment I require of my students is to attend an approved concert and write a review during the 16-week semester. It’s always refreshing to read their impressions afterwards. Below are some of the highlights from their reviews. “Music brings the spirit of aloha to everyone: kids and parents love to enjoy a great Sunday afternoon with nice music.” Roberto C.
The Annual Ukulele Festival in Maui, October 2013 free to all. “These artists are known for their intense and not-so-traditional ways as a duet. Anderson & Roe will take you on a vertical joyride. As soon as they began to play the Animal Suite, I took that vertical joyride and was sitting at a bar and this cool cat comes walking in, looks at me, takes off his hat, and takes a seat with his jazzy swag. Then we move into the elegance of the swan and the next thing you know, I’m in this electrifying swarm of bumblebees racing.” Mauro C.
“The ability to have such skillfulness of control over volume, speed, intensity. As an adult beginner piano student, I know the effort it takes to have even a bit control! How much they must have put in, to develop the seeming ease — to make what sounds they desire to express actually come out of the piano. With grace and speed and sheer elegance!” Jessica V.
“This being my first piano concert, I thought it would be like sitting in a room in front of a ‘Bose’ stereo system, listening to a piano CD, but it was far from it. At times it was like watching a magic show, I sat there wondering how can she cross over, under and around and still play in sync.” Clement A. “All too soon the concert was coming to a close but not before the audience gave the pianist a standing ovation urging them with words of ‘Hana hou!’ and whistling so loud I was sure someone’s ear drum was going to burst.” Tenajah T.
“When the duo returned after intermission, Elizabeth Roe had changed her dress. She was now wearing something that looked like a beautiful silk aloha-type dress.The duo received standing ovations from the crowd on at least three different occasions that night.” Daniel G.
“They added humor in the way they shared the stories of the pieces. I liked the variety of music they played. It makes me want to continue playing the piano.” Debbie F.
“Studying piano has many benefits. When I sit down to play, it is like not having any trouble things in my mind. Greg Anderson and Elizabeth Joy Roe are duo pianists on a mission to make classical music a relevant and powerful force in society.” Shuang X. “At times it was hard to isolate who was playing what part. it sounded as if they were one pianist.” Stephanie R.
“They were all over the place and never seemed to get tired. I was very impressed with their communication style, the way they looked at each other and knew what to do.” John d.
“I think they made the order of the show according to mood and tempo which was nice to have a flow to the music rather than bouncing through ups and downs. They had wonderful chemistry, and I kept watching them both. It was very mesmerizing. What made me go to this concert as opposed to the others was that everyone else was going to this one.” Brandi K.
“Their enthusiasm and joy of music was so evident that it was contagious. They shared with the audience and you couldn’t help but like and have a raport with them. The variety of pieces, moving between pianos and seamless switching for introductions and descriptions of the pieces were marvelous.” Cindee B. “They had a finely dressed narrator, who was accompanied by a local comedian who also helped with the narration and the translation of the well-dressed man’s fancy words into pidgin. This made the time in between the songs much more enjoyable than expected.” Steven C.
“Not only was the music beautiful but it never grew tiresome as you couldn’t predict what key, dynamic, or tempo would come next. Being able to witness and hear such creations was such a privilege and has left me wanting to attend more and more live performances.” Geena G.
“Dan Tepfer did not speak a word. What he did was talk with melodies. Dan’s music also reminded me that finding what you really can become serious about is how you make your life truly yours.” Hidenori S.
“The concert was at Seabury Hall which I thought was a bit too open.” John P.
“Tepfer did not interact with the audience at all during his performance. He did not have to, in my opinion, because his talent did all the talking. If I had to guess, I would say that he played every single key that was on the piano in one performance.” James I. “Though I felt that if the whole 60 compositions were cut down into maybe ten, he could have used the rest of his time to explore other composers and other reinterpretations. I felt that the performance became too repetitious, and I would have cared for some variety.” Paolo P.
“The improvisations and style Tepfer showed with his variations of the classics was without question a passage from the olden time period to new times.” William M.
“He used his everything to play the music. Not only his fingers and foots, but also he was using his soul.” Misako F.
“The setting was great for the event, with the evening cold breeze, the dark path that made it easy to notice the clear starry sky. I am used to loud concerts and everybody dancing around so to sit in my seat for an hour and a half was a little uncomfortable. The animation that Dan displayed while playing was entertaining.” Josh R.
“I had a difficult time finding the building. … I was interested in the way he played. His hand movements, his facial expressions, the way he danced with the music, and he actually hummed to the music.” Melody R.
“Attending ‘Holiday Pops’ was the most beautiful event in my life.” Micah S.
Thank you so much for all of your comments! As a grant writer here at the MACC it is not often that I get to hear the feedback from our audience members. It is so wonderful to hear your comments and be able to use them in some of our grant final reports. Agencies such as the National Endowment for the Arts and the County of Maui, and many others appreciate hearing what it is their dollars accomplish here on our island. A heartfelt mahalo to all of you for enjoying the diversity in entertainment found at the MACC! Thank you, Susan! Indeed, feedback is very important. Thank you for yours! For many of our students, it was their first time to attend such “art music” concerts. For students, the ticket price must be affordable, as they have limited budgets. The value of a new experience is hard to pinpoint. Thanks to the special discounts which made the events comparable to going to see a movie, they were affordable. Going together and being able to sit together also encourages their attendance. Previous Previous post: Why studying music gives extra-musical benefits?